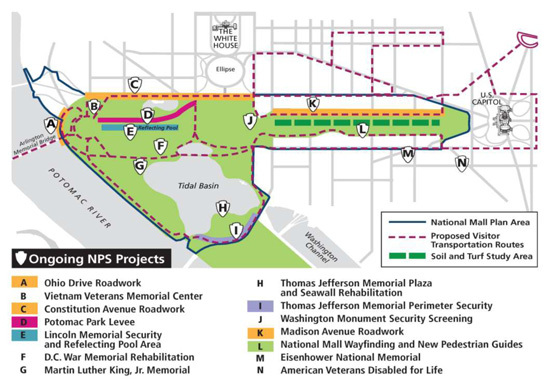 A number of projects are underway on the National Mall and this section provides a status update. An accompanying map shows where the projects are located. While there are several different types of projects they are addressed as cumulative projects in the National Mall Plan. 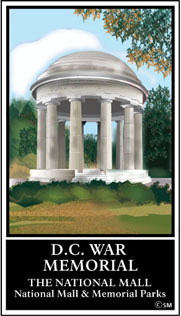 As the National Mall Plan began in 2006 there were a number of projects already approved by Congress. These included the Dr. Martin Luther King Jr. Memorial, the Vietnam Veterans Memorial Center, and the National Museum of African American History and Culture. Following Hurricane Katrina the U.S. Army Corps of Engineers established new criteria for levee systems, and a project was developed to upgrade the Potomac Park Levee protecting the downtown from flooding. A number of road projects were in line to be funded. Planning had been completed for a new visitor transportation system. Finally the American Recovery and Reinvestment Act offered the opportunity to address some of the nearly $450 million in deferred maintenance repairs needed.